3 Where do I find these drills? What is your favorite sport? Is it the rush of playing basketball, the thrill of playing hockey on the ice, or the endurance it takes to swim competitively? For me, and I know for many others, my favorite sport to play and watch is soccer. Soccer (also known as football in many European countries) is the most played sport worldwide as it cannot be easier to play; all you need is a ball and some players. It always amazed me that anywhere I traveled in the world, whether that be in Europe, throughout Asia, or even in the smallest community in Africa, there were children playing soccer. Soccer can bring people together and it is a sport that I encourage everyone to play at least once in their life. Soccer builds your endurance and gives you one of the best workouts you’ll experience while playing a sport. At the same time, it teaches you how to work as a team, think on your feet, and become a strong leader. This is why my parents put me in soccer as a child and why I recommend it to you. For those of you reading this who have never played soccer, or are just beginners, you may be confused about what dribbling the ball in soccer is. I remember when I first heard of dribbling, I immediately thought of basketball, dribbling the ball up and down the court, and was baffled at how I was supposed to do that using a soccer ball. Essentially, when you dribble the ball in soccer, you are keeping it alive in between your legs while protecting it from being stolen. This requires great skill as you continue dribbling the soccer ball, weaving your way in and out of players, to get closer and closer to scoring a goal. It is a skill that must be developed, and is integral if you are to excel in the sport of soccer. Right now, go to YouTube and watch even a few minutes of a professional soccer game. Look at the way these players dribble the ball back and forth between their legs even as they run. It is a fantastic skill and the best part is with training you will be able to do that too. In order to become a pro at dribbling the soccer ball, you must start soccer dribbling drills. Drills are a way to hammer in your training as you repeat them over and over again in a fast-paced environment, so that it will slowly become second nature and you will be able to do it naturally. Once you engrain your soccer dribbling drills into your body, you will automatically do it on the field without even thinking about it. 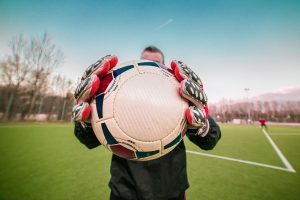 For months, I thought I could never do it, but once I started doing my soccer dribbling drills, and committing to them, my entire persona as a soccer player changed. I became more confident and, therefore, was all-around better at my soccer playing. Where do I find these drills? That is the number one question I get asked all the time, especially for people who don’t have enough money to go to a soccer coach every week or join a league. There are so many YouTube videos and various training resources available online that it can be hard to know which one you should buy or sign up for. Well, I am happy to say that after extensive research, I have found the best online soccer training guide that also focuses on your soccer dribbling drills. It is called “The Epic Soccer Training System,” and is available for purchase online. Out of all of the various programs and systems I looked at, and even bought, this one (created by professional soccer player Matt Smith) definitely had the best drills I was looking for. This training system focuses on creating an all-around great soccer player, starting first and foremost with your own dynamic soccer technique. It has videos and e-guides on the best ways to dribble a soccer ball, and when I started using this system, it completely changed the way I played. It made me stronger, faster, more dynamic, and a far better player. I learned how to pass, work as a team, and strengthen my shots. Now, of course I understand that not all of you will want to buy the Epic Soccer Training videos, even though it's totally worth the money, and I also understand that you don't want to spend the time trawling through all the videos on the internet to find the decent ones. This should be the starting point for all beginner soccer players who want to improve their dribbling skills. Use a bunch of cones, jumpers or any obstacles you can find, place them in a straight line and just practice weaving in and out of the cones. Do this with a single foot to start with, making sure you practice both feet, then use both feet to move between the cones. This is a great drill to help you in tight spaces and 5-a-side games and will really improve your touch. When you start, make sure that you focus on not hitting any of the cones, rather than speed. Once you master the course, then gradually ramp up your speed and see how fast you can navigate the line, without hitting any cones. After you've mastered the line drill, spread the cones out a bit further and practice dribbling between them. ​This is a great drill, which will help you to keep control of the ball as you accelerate and turn. This is also a great drill to improve your fitness, as you're moving at fast pace and you're heart will be racing! Next, move on to putting your cones and forming a narrow lane, almost like a runway. There will be many times in a soccer game when you need to run with the ball at full pace, for example, if you beat the last defender and are baring down on goal. This drill will really help you keep control of the ball whilst running at pace. Notice how he uses the outside of his foot to tap the ball lightly ahead of himself and focuses on the number of paces he takes between each tap of the ball. In the first drill he takes a couple of paces, which would be used when defenders were behind him and he was trying to break away, but in the second drill he takes 1 pace every time he taps the ball, which is a technique you'll use if you have a defender in front of you. You'll need to keep the ball closely in control before either knocking it past them, feinting or doing a trick to beat your opponent. ​The final drill in this video will help you to master the technique of accelerating with the ball, stopping in a controlled manner and accelerating away in the reverse direction. Again, if you get the chance try to practice these drills a few times a week and your soccer dribbling skills and stamina will increase 10 fold. Another core component that you'll need to add to your game, which will help you with your dribbling skills, is mastering your footwork. Your foot really needs to get comfortable with the ball and you should be able to manipulate the ball as if you were touching it with your hands. 6 of the best close dribbling touches that will help you move the ball seamlessly between your feet. With feet like these, you'll be bamboozling defenders, left, right and center! I love the way the drills are slowly broken down for us, before she steps in a shows how the pros do it! These next 2 videos that I have cho​sen, will help test the different dribbling skills that you have learnt from the previous drills, as they involve both close control and longer dribbles. Use this set up of cone to simulate a group of defenders and weave your way around these cones. OK, so you've learned how to drill around cones at speed now, but I think it's about time you added some finesse to your game and if you add these simple tricks to your dribbling skills you'll soon be the first on your team sheet. Fake shot - The trick is to make it as realistic as possible that you are going to shoot, before you flip the ball back the other way and beat the defender. Double Stepover - Dazzle your friends with a left and right stepover, and the defender won't have a clue where you're going! The final ​video that I have chosen is for those fancy pants out there. Yes, you know who you are and we know that you like to show off so have a look at this video and you'll see a number of drills that will help improve your dribbling technique, whilst raising a few eyebrows at the same time! Soccer dribbling drills can be hard at first, but once you commit to them, I promise they will become part of you. As you can see from the above, there are all types of drills available that are suitable for beginners, advanced and even show-offs. The best thing is, all you need is a ball, a few cones and a small area to practice. Remember, if you like these drills then don’t forget to check out “The Epic Soccer Training System”, which really is the all round package for developing your game as a top soccer player.